This is a fantastic place, sprawling for miles. The Company is in its centenary year and the notepaper currently carries a commemorative crest. Only one pit is still being worked, No.11. Of the locos, the Hudswell Clarke (1742 of 1946) was in steam at the 'shed' when I arrived, but no-one was about. Hunslet 299 of 1882 was standing over an inspection pit, but looked very rusty. After inspecting these two, I had a wander round, tripping over rails hidden in the grass all over the place, and took a look at the derelict No.8 pit buildings which were creaking and groaning in the howling gale. The wind was so bad that I had difficulty keeping my feet at times in this bleak spot, and every so often rain and hail would come lashing horizontally into my face. When I arrived back at the Hudswell Clarke, I found that it now contained driver and fireman, and neither seemed in the least surprised at the hooded figure who appeared dripping out of the storm and asked where the other locos were. The driver said that there were four working locos, the Kerr Stuart being stored out of use and the Pecketts scrapped. 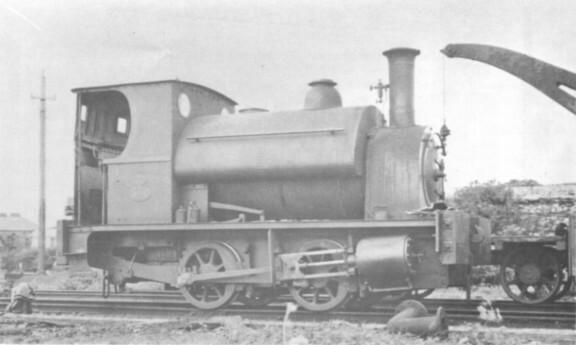 He pointed out a Peckett frame lying in the grass, and I later found a saddle tank. 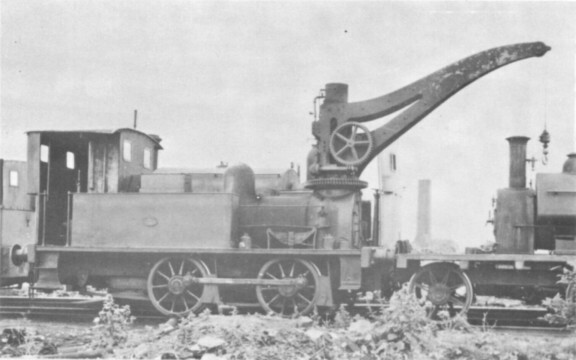 The Neilson crane tank was still in the shops, but expected back at work in 1966. The new boiler cost £2,000, a considerable investment and also a good omen. The crane jib was still lying on the floor, but the engine has been magnificently repainted bright green, with red wheel centres and coupling rods. It will be a sight for sore eyes when it comes out in the open again. That left the Avonside, and when I asked where it was, I was cheerfully told "Oh, that's a good way away; over there by the lighthouse. See?" I saw all right. The lighthouse was a speck on the horizon! Not so far in a direct line perhaps, but I was told that the best way was to follow the line past No.8 pit. By this time I had decided that I couldn't possibly get any colder or wetter, so I set off along the track. However, I succeeded in missing my way and ended up on top of the sea wall, hardly the most pleasant spot in the prevailing weather - a grey sea frothing at one side, what appeared to be a swamp on the other, and a gale blowing straight along the top. Anyway, I eventually spotted a crane with a small black speck beside it, from which smoke was blowing in great gusts, and I clambered down the side of the wall through bushes and brambles into the swamp. Here another discomfiture was added to my list - my shoes filled with water. Squelching up to the loco, I was treated with the same lack of surprise by the crew. The Avonside was quite grubby, but in good condition and I was invited on to the footplate to dry out. 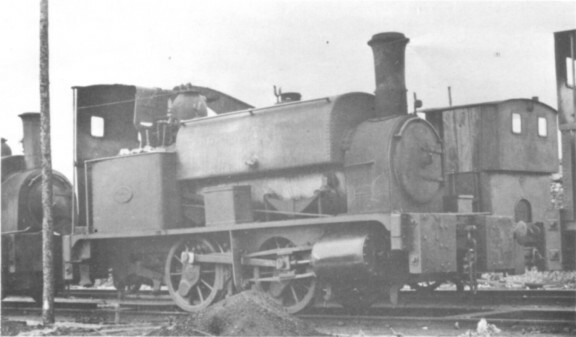 The duty of this loco was to take sand from the sandpits up to No.8 pit where it was taken underground to fill in areas from which ore had been extracted. And that was it. I had seen all four locos. I had had grave doubts about the whole thing at several moments, but as I trudged back into Millom, head bowed into the wind, I finally decided that it had all been well worth while. I had a similar kind of experience nine days later (26th November) when, after a day at Lincoln I planned to visit some of Stewarts & Lloyds Minerals' ironstone quarries. As I should have to miss breakfast anyway to do the full programme, I decided to call at Colsterworth additionally, there picking up the bus to Market Overton. Two weeks before, the rail service to Grantham had been withdrawn, the alternative being the 05.35 bus. I awoke in time, to find the pavements glistening under gusty squalls of rain, but I made my way through the deserted streets to the bus station. A journey on a bus at this hour is something of an experience as many of the travellers are regulars on chatty terms with the crew, and I felt an interloper! It was still raining hard when I alighted at Colsterworth, but I found a congenial spot in the boiler house to await the arrival of the Manager to seek permission for a look round; and it was raining when at 10.00 I stepped off the bus at the concrete approach to Market Overton. The southwesterly gale was, very fortunately however, at my back almost the whole of the day. Temporary respite at the loco shed to catch up on the latest events and to inspect the Drewry diesel on trials, then off again; but the rain was slackening and when I reached the junction to Thistleton it ceased and I was able to dry out. Thistleton itself was a scene of desolation, with all the track gone except for a sufficient length to accommodate the rolling stock, mostly beyond the road crossing. The Ruston was outside, sheeted over, the other two locos in the shed. The standard gauge track was still in and I understand there is a possibility of opencast working here, requiring the connection to. Gunby, otherwise disused. The track of the latter was in good condition but rusty, and the thickets on either side made it a pleasant walk. 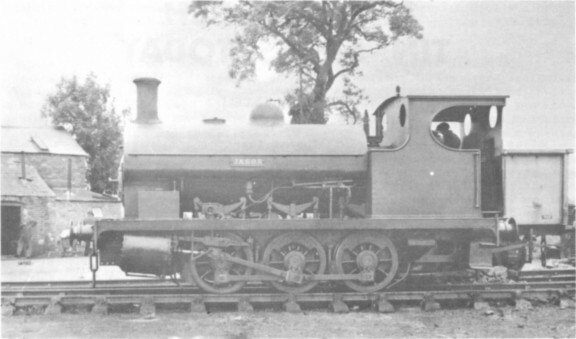 The two oldest locos - JASON and 55 - were dead in Gunby shed, and I was told that GUNBY had been transferred to Harlaxton, leaving the three Barclays in regular use. The old line to Sewstern pit, which came in opposite the loco shed, had been lifted, and a new outlet giving direct access to Stainby Sidings put in, shortening the distance by well over a mile. Two locos were working this pit. After a chat with Mr Sibley and his colleagues, I ventured out again towards Stainby, with the wind still blowing hard and squally rain from time to time. CHURCHILL had gone at last; there had been some scheme to use her frame at Thistleton, that lapsed with the demise of the latter, and the remains were cut up twelve months earlier. At Stainby the delightfully situated loco shed had gone to Harlaxton, but its site amid the larches was well marked. As I walked up, SEWSTERN, brass and copper shining as always, came drifting down from No.5 pit. This has been reopened and now stretches over part of the site of the route to The Ashes, which quarry (No.15) has gone over to lorry operation. The line has all gone but the site of the level crossings were identifiable. Nineteenth century locomotives in Hodbarrow stock. 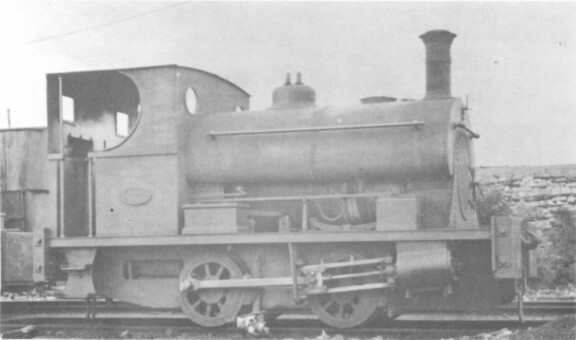 Above: Crane tank by Neilson, no.4004 of 1890. I chose the shortest route between Buckminster and Harlaxton via the ancient trackway Sewstern Lane (locally called 'Green Lane') but it is not - I soon found out - the place for a winter walk unless frozen solid. It was three miles with mud, pools and ruts all the way except for a short stretch where it crosses the concrete of a disused airfield. I've done lots of footslogging in my time, but this was the muddiest walk ever. In summer it would be delightful - the grassy trackway rooted in history (it was an old drove road, and King Luds Entrenchments is one point on this section known to the naturalists) crossing streams and lanes, with empty fields each side - but not for me in winter again! Incidentally, there is an error on the one inch Ordnance Survey map which shows the lane crossing the High Dike branch by bridge whereas in fact there is a level crossing. At long last I reached the lane to Hungerton and Harlaxton; the wind was as strong as ever and now it began to rain in earnest - but I didn't mind much, as I was now reaching the end of the journey. Harlaxton was busy, with four locos in steam; GRANTHAM and 51 were in the ex-Stainby shed, AJAX under repair and RHONDDA stored at the end of the yard. Movements in the yard are controlled from a centrally placed signal box; the signalman has been there since quarrying commenced and has some interesting tales to tell. With notebook filled once again, I set out on the last stretch down to the Denton crossroads to catch the bus to Melton Mowbray - pretty wet and cold, but with much satisfaction at having completed the trip. It is a day I'll long remember. Was it enjoyable? Sid Barnes would know. I knew too as I sat down to a large tea at Melton Mowbray.